Toshio Ban’s The Osamu Tezuka Story: A Life in Anime and Manga is a ground-breaking manga biography of one of Japan’s best-loved and best-selling creators, the creator of Astro Boy and Kimba the White Lion. At 900 pages, it is a breathtakingly thorough sweep through Tezuka’s post-war struggles to become a comics artist, his misplaced faith in the financial returns of animation, and his pioneering efforts in setting up the studio Mushi Production. Ban’s approach often has the relentless, linear plod of a TV movie, beginning with his leading man’s infancy, and working all the way through to his death. But in doing so, he draws deeply on Tezuka’s own memoirs, citing childhood incidents as crucial inspirations in his later work, such as the sticky-up hair that inspired the coiffure of his iconic Astro Boy. Most subjects would not warrant this intensive focus, but Tezuka is such a fundamental figure for understanding modern Japanese media that there is sure to be plenty of interest here for fans and scholars. Ban’s artwork is deceptively simple. At first glance, it looks like the journeyman drafting of an educational comic, but actually goes much further. His depictions of many scenes are photo-real, deriving directly from documents, photographs and location hunts in the places under discussion. When Ban writes about the arrival of a letter from Stanley Kubrick, offering Tezuka the production designer’s job on 2001: A Space Odyssey, he doesn’t just tell you about it. He shows you the envelope it came in, complete with Kubrick’s return address. Translator Frederik L. Schodt almost fell off his chair in surprise when he got to a page recounting a visit by Tezuka to America, realising that the youthful hipster in one panel was himself as Tezuka’s interpreter, faithfully recreated from a forgotten photo. Here we see the formative years of a young comics artist: the temptations of a career in medicine; the irresistible but risky pull of animation; the struggles of a young studio, and the confusing whirl of international attention. Tezuka is propelled to the height of the manga profession, only to risk it all with a blind-faith bet on animation. Much of the dialogue is taken, word-for-word, from his own books and speeches, including a wistful farewell in which he speculates about how the children of the future might regard the Earth from space. Cue Ban’s artwork running with Tezuka’s ideas to present a slingshot, sci-fi ending, as Tezuka’s work forges on into the future without him. Ban also injects some subtle artistic elements. As Tezuka’s long-term assistant, he has mastered his boss’s style, drawing much of the manga in a direct pastiche of the original. Clearly channelling the idea of how Tezuka himself might have approached the project if he had been able to draw his life-story from beyond the grave, Ban presents the whole thing as a fantastical documentary, narrated by characters from Tezuka’s own works. The art-style degenerates into more amateurish cartooning when the young Tezuka is telling a story to an indulgent audience of relatives, but blossoms into richly toned artwork when recreating adult memories. 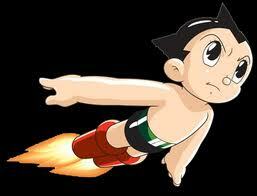 The Osamu Tezuka Story is an unparalleled gateway to Tezuka’s life and work. Many critics, myself included, warn that Tezuka and his estate have been expert curators of his memory, and that Ban’s work typically shines a spotlight so brightly on its subject that many of his contemporaries are confined to the shadows. But that doesn’t stop Ban from noting some of the low points, including Tezuka’s resignation from his own studio and his flirtation with depression. Unless you can read Japanese, this is the closest thing you’ll get to a warts-and-all portrayal, and undoubtedly the most informative, detailed and illuminating work on manga and anime to be published in English this year. Jonathan Clements is the author of Anime: A History. This article first appeared in Geeky Monkey #10, 2016.